If you thought Saints fans were over the NFC Championship game and the “no-call,” think again. Blind referee costumes and yellow penalty flag costumes were all the rage in New Orleans on Fat Tuesday as the city marks the last day of Carnival. A Rams defensive back leveled a Saints receiver with a helmet-to-helmet hit at a crucial point in the final minutes of regulation. The Rams went on to win the game and then lost to the New England Patriots in the Super Bowl. NFL officials acknowledged after the game that flags should have been thrown. But that has done little to assuage Saints fans. Nancy Halbert of Baton Rouge dressed up as a blind referee for Mardi Gras. She was joined by similarly dressed friends who walked through the French Quarter with canes. She says they’ll probably never be over the game but they have been having a “ball” walking through the Quarter. Layers. That seemed to be the key to surviving a cold Fat Tuesday in New Orleans. Temperatures in the New Orleans area were in the 30s and 40s Tuesday morning as thousands of people lined the streets to watch parades and catch beads and throws. People along the parade route were wearing multiple layers of pants, sweaters, hats, blankets, and gloves. Lorenzo Bridgewater of Slidell, Louisiana, got to the parade route at about 4:30 a.m. to get a good spot. He wore two pairs of jeans, two pairs of socks, a sweater, a thermal and a shirt under his jacket. But he says he loves Mardi Gras and it’s worth getting up this early in the cold to get a good spot. The party is on! 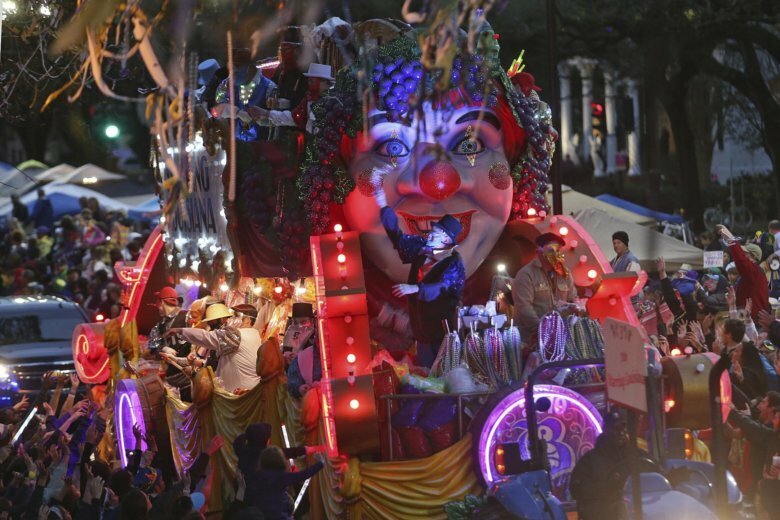 Thousands of people are expected to gather in the New Orleans area to celebrate Mardi Gras. Fat Tuesday marks the final day of the season of revelry and costumed merrymaking that began on Jan. 6. After rainy weather affected some parades Sunday, the weather is expected to be cold but sunny. The festivities kick off early Tuesday morning when the Northside Skull and Bone Gang walks through the Treme neighborhood before the sun comes up, waking people up to celebrate the day. That kicks off a busy day of parades along St. Charles Avenue, walking groups in fancy costumes traveling through the French Quarter and the Marigny and Mardi Gras Indians in finely beaded costumes taking to the streets amid the revelry.